Celebrations mean food—lots of it! But if you, your family, or your friends are among the ever-growing millions of people eating vegan, you might be wondering: How can I make classic holiday and party fare—without milk, cheese, eggs, or meat? This cookbook answers that question! New Year’s Eve • Valentine’s Day • Game Day • Mardi Gras • St. Patrick’s Day • Easter • Cinco de Mayo • Independence Day • Halloween • Thanksgiving • Hanukkah • Christmas • Kwanzaa • . . . Plus Birthday Sweets! Not a gourmet chef? Not to worry! Everything from Naw-Fish Étouffée to Vanilla Bean Ice Cream is quick and easy to prepare. 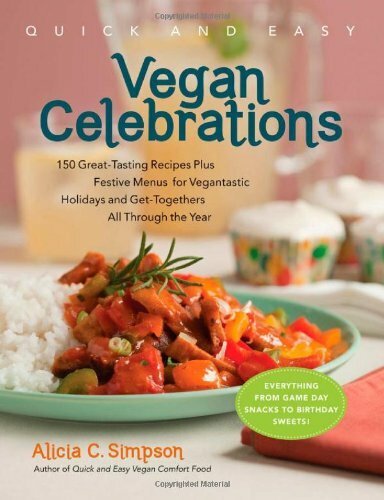 Quick and Easy Vegan Celebrations takes the guesswork out of get-togethers, so all you have to do is send out those invitations—and enjoy the vegan cooking, partying . . . and eating!